Sling Media, the company behind the popular (and very cool) settop boxes that allow you to stream cable from your house to your computer, looks like it has outdone itself. At this week’s Macworld the company will be showing off its upcoming iPhone application, which effectively gives iPhone owners instant access to their Cable TVs and Tivos from anywhere they have a network connection. Unfortunately, you’ll have to wait a little longer (the company says that the app will be submitted to Apple some time in Q1), but it looks like it will be well worth the wait. SlingPlayer Mobile gives consumers their entire home TV experience, including local channels, local sports teams, video on demand, pay per view, etc. Any program that you can watch on your sofa back home, you can now watch via your iPhone using a standard network connection. 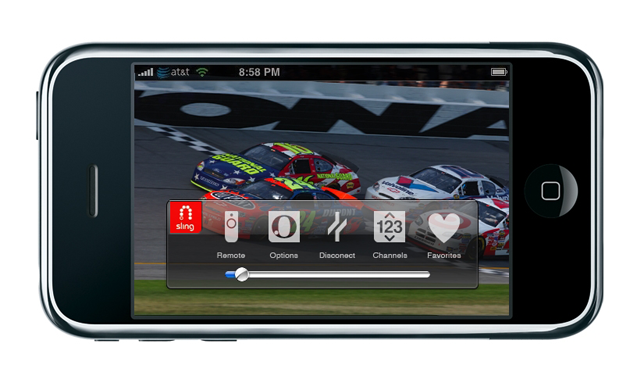 In addition, SlingPlayer Mobile for iPhone users can also control their home digital video recorder (DVR) to watch recorded shows, pause, rewind, and fast forward live TV, or even queue new recordings while away from home. The company will also be announcing SlingPlayer for Mac HD, which gives Mac users the ability to watch high definition content streaming from their HD SlingBoxes using a web-based player on the company’s recently launched video hub Sling.com.